The K308-SH provides users with a secure solution to switching keyboard and mouse (KM) control of eight computers that each use multiple displays. With support of up to 32 total displays, users can create the ultimate in secure KM management. This is a superior solution to operating a KVM environment of connected computers with multiple displays. Users can simply connect the monitors directly to the computers and use the K308-SH to switch between computers for secure KM operation. Additionally, device's administrator mode provides many customized settings from display arrangement and size to cursor speed and acceleration. Audio output can also be configured to follow the cursor or can be set by the user to any channel. A secure keyboard and mouse switch is a device that is specifically designed to enable isolation between connected computers. Computers are typically connected to different networks and isolation between these networks must be assured to prevent data leakages and intrusions. Secure KM switches rely on physics (optical diodes) to prevent data leakages between coupled networks. Secure KM switches do not require any cables between computers any shared bus or network or any installed software. The K308-SH offers impressive levels of protected communications even when connecting computers that are on different levels of security clearance and Internet access. The K308-SH utilizes unidirectional optical data-diodes which insulate all connections from any possible points of data leakage among peripherals. Every K308-SH secure KM switch is rigorously and extensively tested to ensure it will remain stalwart against any known form of KM and KVM security attacks. The K308-SH is specifically designed - and has been used - for national security applications. The unit has been certified to meet EAL 4+ standards to assure it provides the highest level of security possible. After manufacturing, each unit is provided with a special holographic tampering-evident label to ensure the device has not been tampered with. Virtual Display Technology (VDT) is a cornerstone of the K308-SH's functionality. 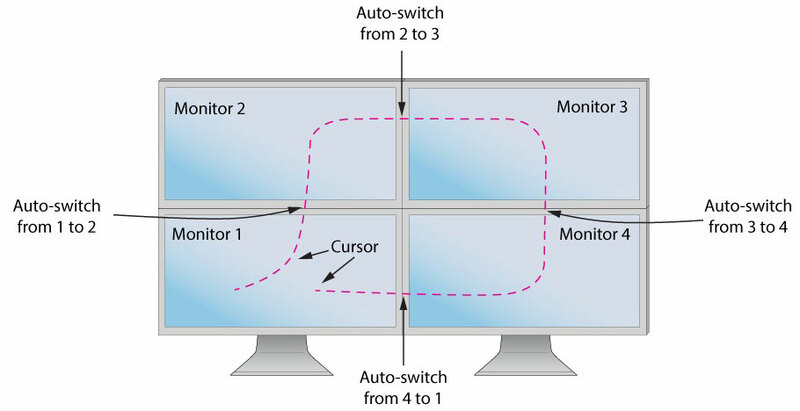 VDT enables seamless cursor and keyboard switching between multiple computers by simply moving the cursor to that computers display(s). VDT allows administrators to configure any desired displays configuration with same or different size and resolution. The KM switch occurs instantaneously. Peripheral Security USB supports only keyboard and mouse through host emulation. Data-diode assures USB unidirectional flow from devices to host Firmware change can not cause leakage between channels or data export.